Saturday 10th November will see Southeastern High Speed Javelin Class 395 visit Portsmouth and Southampton for the first time. Tour operator UK Railtours have been running the Class 395 Javelin tours for 5 years and this year will feature unit number 395018 in its new poppy livery. UK Railtours have run the javelin tours annually for the past 5 years, for each of the 5 years of the first world war, raising funds for the Royal British Legion’s Poppy Appeal. Each year, the tour visits parts of the South East rail network where the Class 395 units are very rarely seen. 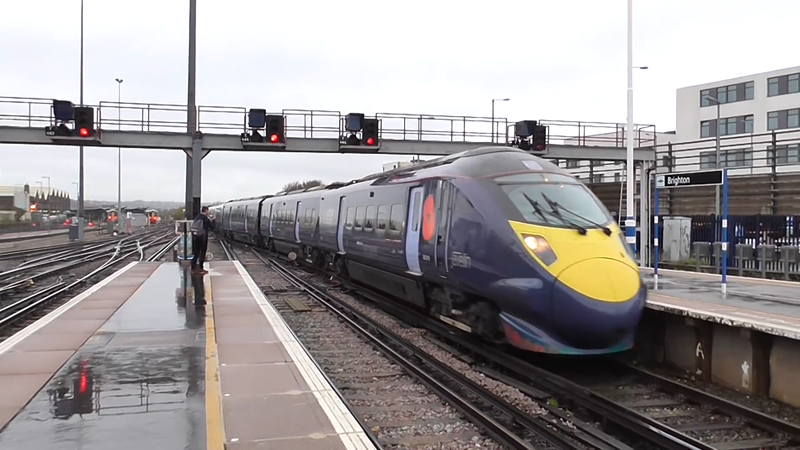 Commonly found on the Kent HS1 route from St Pancras International to places such as Ashford and Ramsgate, this year’s tour goes west, visiting Bognor Regis, Portsmouth Harbour and Southampton Central. Full route timings will be posted here once they’re available. The train will run fast from St Pancras International to Ashford International, before heading up to Tonbridge and Redhill. Therafter heading southbound through Gatwick Airport, Horsham, Arundel to Bognor Regis. The tour will there reverse back to Barnham before proceeding to Chichester, Havant and Portsmouth. Thereafter it will head to Southampton Central and retrace the outward route on the return. To secure a place on the Class 395 Javelin train from St Pancras to Portsmouth via Ashford International, please visit UK Railtours website. You can use our live train times feature closer to the time to see tour timings. They’ll also be shared here once available. Hi. Im the video editor of Portsmouth News. Are there any footage and photos when the train came in to Portsmouth, please? And is there anyone we can speak to about the visit please?